Wireless transmission of information has been around for centuries. We are all used to connecting our smartphones, tablets and laptops over radio protocols such as Wi-Fi, 4G and Bluetooth. Over the past years, solutions for home automation, connected cars, smart cities and other Internet of Things (IoT) areas have raised awareness for other types of radio standards like Zigbee, LoRaWAN, NB-IoT and Z-wave. The common denominator for these types of communication is that it is carried out on a very small chunk of the popular Radio Frequency (RF) spectrum which, in turn, is a fraction of the overall electromagnetic spectrum that spans not only RF but also various types of light, gamma rays and x-rays (see the figure below, borrowed from miniphysics.com) . Li-Fi is a technology where light waves (rather than RF waves) are used as the communication medium. This is nothing new. In fact, visible light was used to carry information in some of the earliest semaphore and smoke signal wireless systems in history. Camera based IoT devices are often using the same spectrum. In this article, we take a look at how Li-Fi works, its pros and cons, how likely it is that you have to swap your Wi-Fi router to LEDs in a couple of years and which applications/IoT areas where we expect to see a lot of Li-Fi in a not too distant future. What is VLC, OWC and Li-Fi? Optical Wireless Communication (OWC) refers to wireless communication over infrared (IR) light, visible light (VLC) or ultraviolet (UV) light. Applications using this spectrum today range from remote controls, video camera IoT solutions, tracking systems in healthcare, access networks and laser backhaul links. Li-Fi today normally refers to data being transmitted over visible light. Just as RF based wireless solutions like 4G, Wi-Fi, 5G and Bluetooth, Li-Fi uses transmitters and receivers to communicate. The transmitter typically consists of Light Emitting Diodes (LEDs) of the same type you buy in your local store. It could also be the flash on your mobile phone, a LED display, the spotlight of a car, a traffic light or something else that emits light. Data is modulated (by single or multi carrier techniques) by adjusting the brightness of the LED at a very rapid pace that is not noticeable by the human eye. With visible light, it is even possible to do this in a room that the human eye would experience as ”dark”. The receiver (which could be the camera on your phone) can register the differences in brightness and decode the transmitted signal even in full daylight. 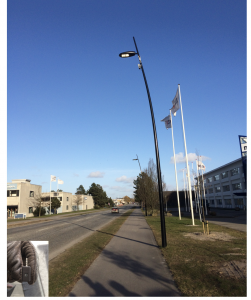 The figure below shows Li-Fi demonstrated from regular street lights in Denmark. The receiver in this demo system is shown in the bottom left corner of the figure. Which benefits do Li-Fi bring over RF based wireless communication technologies? Massive throughput. Almost 10 Gbps peak rates have been demonstrated from a single light source. Much simpler and cheaper transmitters and receivers. Modulating light intensity does not require any radio front ends with amplifiers, filters and antennas. Less patent royalties have to be paid to chipset makers. 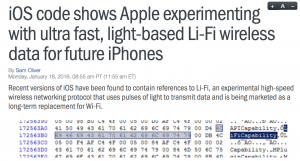 As the result, Li-Fi is expected to be 10x cheaper than Wi-Fi. Extremely low energy consumption. This brings a lot of benefits to body-near devices like AR/VR glasses, watches, bracelets and badges where the battery lifetime is crucial for the end user experience. High security. Only if you can see the light you can ”hear” the communication. No RF pollution. As a Li-Fi transceiver does not emit RF waves, it does not generate Intermodulation Products, spurious emissions, noise or interference to RF equipment. Unlike for RF base stations and access points, you never have to find sites for LEDs. Those already exist. 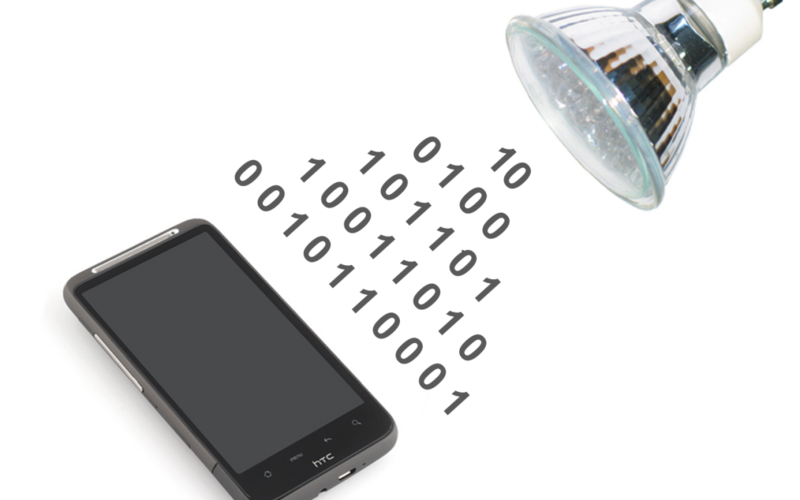 What are the challenges for Li-Fi? Li-Fi obviously requires the receiver to ”see” the light sent by the transmitter. It does not have to be line of sight, but the light has to be bright enough That is not the case with RF communication which often can traverse walls and other obstacles. The main problem for laser links, remote controls and Li-Fi is therefore that the signal path could be blocked by clothes, fog, snow or something else. Another challenge is that you need backhaul to the LED armature. Albeit that could be a wireless link (over RF or light), a typical installation in an enterprise building or a hospital would require each armature to be backhauled by an Ethernet link (LAN cable or optical fiber). No problem in newer buildings, but it could be a retro-fit challenge. Which are the typical application areas for Li-Fi? AR/VR glasses, watches and other gadgets that are not placed in a pocket and where battery lifetime is crucial for the user experience. Internet of Things applications. Here, Li-Fi can be an in-room carrier of data from battery-powered devices to a sensor platform placed in the ceiling, it can be used for tracking of gadgets in a hospital or factory, it can be used for indoor wayfinding and on-boarding of devices in a smart office. The fact that you easily can communicate with a LED display opens doors. Access networks in sensitive environments where security or RF pollution is unwanted. Airplanes, nuclear plants and hospitals are often mentioned. Traditional Wi-Fi access points operating at 2.4GHz and 5GHz. The same type that you have at home and in your office today. These were once created in order for average Joe to be able to very easily cover an apartment or mid-sized American house from the point where the cable modem entered the building. Doing the same with Li-Fi would require cables to every room and an army of electricians. The higher frequency makes it very hard for signals to penetrate walls. Good as you will not hear your neighbors network, but it also means you need one WiGig AP per room where you need capacity. Since WiGig is created for short-range, high capacity, in-room use cases, it is much more prone to competition from Li-Fi. If we compare the two technologies, we expect Li-Fi to come out both cheaper and a lot more flexible (pre-integrated in cameras, LED screens etc.) over time. Li-Fi is an extremely potential technology that we expect a lot from in the coming years. We will follow this space closely.